The South African artist kicks off the new center for international humanistic research. Just over a year after the Neubauer Family Collegium for Culture and Society was announced in summer 2012, the new center for humanities and humanistic social sciences research hosted its first public lecture in a full Mandel Hall Thursday evening on what President Robert Zimmer called an “important day for the University of Chicago” in his introduction. 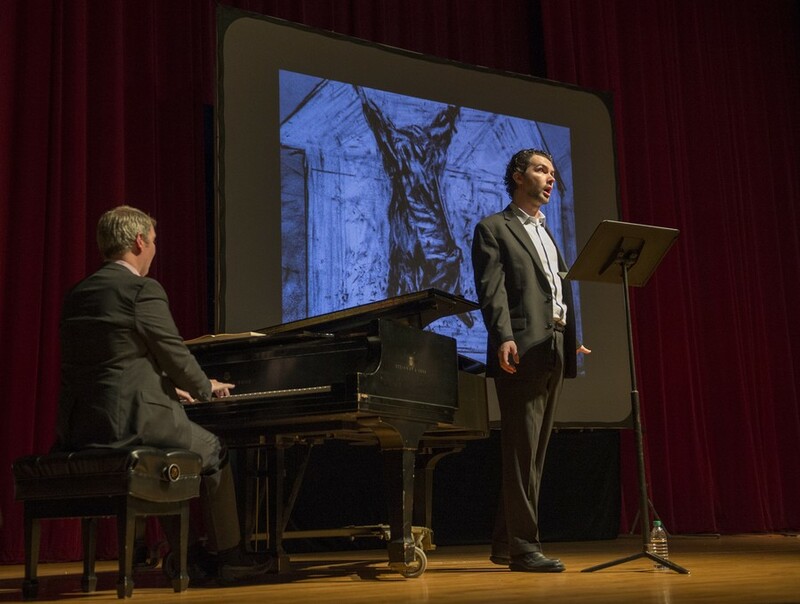 Renowned South African artist William Kentridge delivered a multi-genre artistic performance for the Collegium’s inaugural address. He presented still drawings and stop-motion animated films of shots of drawings he made over the pages of large books. The films were shown multiple times, each time with a different sound in the background—various noises or voices, and later musical accompaniment by Craig Terry (piano) and John Irvin (tenor) from Chicago’s Lyric Opera. The multimedia approach behind Kendrick’s art reflected the Collegium’s vision for humanistic research, according to Associate Director Josh Beck. “There’s a kind of harmony in the way he approaches his work and how the Collegium aspires to stimulate collaboration and creative transcending of fields, of disciplines,” he said. Named in honor of the $26.5 million gift of Joseph (M.B.A. ’65) and Jeanette Neubauer, the new center is the product of over two years of discussion by University faculty looking to establish Chicago as an international hub for innovative humanistic research. The Collegium’s unique aim begins with its name: collegium, Latin for “colleagueship” or “partnership” in the broadest sense. Rather than simply providing financial support for research in a particular discipline, as many conventional research centers do, the Collegium provides funding and administrative support primarily to interdisciplinary research projects sponsored by faculty from different disciplines, making it a “center of centers.” Moreover, the Collegium has explicitly international ambitions, favoring projects that require collaboration with faculty elsewhere around the world and “ask grander kinds of questions,” according to Josh Beck. When the Collegium issued a call for proposals from University faculty last year, it received 49 proposals from professors in every department in the humanities and social sciences, biological sciences, and all six professional schools. The Collegium ultimately selected 18 projects, involving around 50 University faculty and 11 visiting faculty. While research is the Collegium’s focus, Beck stressed that the center’s mission would also enrich the University more broadly. “The core of this is about promoting collaborative faculty research that can transcend boundaries. But the impact is much bigger. The impact is felt all over campus,” he said, citing the large number of students who are researching alongside the faculty on Collegium projects. The Collegium’s permanent home at East 57th Street and South Woodlawn Avenue in the former Meadville Lombard Theological Seminary is not yet completed, but operations are underway in shared space in the Regenstein Library. Scheduled to open in early 2015, the space will feature art and media exhibitions related to Collegium projects as well as a video conferencing space for faculty to collaborate with researchers abroad.